Giga Gelovani is an artist from Georgia and student here at LAO-Le Arti Orafe. He had the opportunity to be at the multimedial event “Klimt Experience” produced by Crossmedia Group, from March 3th to March 19th, in Santo Stefano al Ponte Church in Florence. LAO exhibited a selection of jewels inspired by Gustav Klimt work and creations,enigmatic, sensual and unique, realized by Giga Gelovani. Let’s meet him! “This is my first personal exhibition. Developing the collection proved to be a fascinating process. Currently, my experience is somewhat limited, since I only finished the LAO jewelry design course a year ago. As a part of my last semester, I had the opportunity to work on my collections. Nevertheless, transferring paper drafts to real materials proved to be a challenge that I took on with great responsibility. How did you developed your work? I spent a bit of time working on my drafts, since it is challenging to pick a candidate that best fits the theme from a set of nearly endless possibilities. 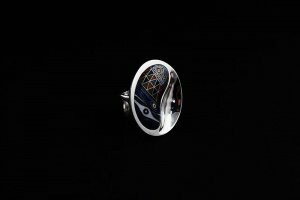 I created organic forms using two main techniques: Georgian cloisonné enamel and chiseling. 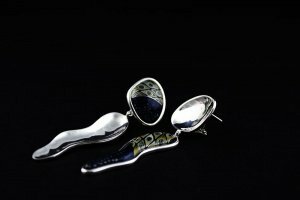 Since the exhibition is an homage to Gustav Klimt, I strived to channel his colorful world using convex enamel forms that organically morph into silver indentations. I have many years’ worth of experience of working on cloisonné enamel. I further honed my metal design skills, such as clasp design, at LAO. How did you live this experience? Exhibitions are important to me since I have personal relationships with the individuals I am creating for. I had the opportunity to meet people from all over the world whose assessments of my art helped me further perfect my craft. It was particularly stimulating to work in Florence, a city with enormous cultural heritage. I would like to especially thank my school, Le Arti Orafe, as well as Giò Carbone and Anna Balatti, for creating an excellent work environment for me, and teachers Valentina Callo, Jasmina Carbone, Mauro Vegliante, Pasqualina Are, and Luigi Piantanida.